Here's a weird thing: I started the Walter's Files at number 69 (Aiden's) just as a dumb joke, but it just so happens that now I've hit number 92 directly following the publishing of the strip of the same number. I haven't used Mr. Smith too much. He's a lot of fun. I used aspects of the original Iron Man, and a dash of Robert Downey Jr., and a helping of what Jason cooked up, mixed it in a bowl and sprinkled generously with a helping of some kind of aging Latin Casanova character archetype, which seemed appropriate for Warmonger for some reason. One of the main things that separates Smith from Iron Man is Jason and I never made any plans to have him injured as part of his origin the way Stark was. Without a life-threatening shard of metal having to be perpetually kept away from his heart, I think Stark would be a lot less grounded as a character, and the result would be something like Smith. Gadgets are an integral part of many characters' repertoires, enough so that I felt there needed to be a class just about gadget-making. Who better to be the instructor than the ultimate gadget-maker? Plus, there are so many scientist superheroes in comics, many of whom are represented as parodies in Super U., only one of them can be the straight-up Science teacher. My Mr. Fantastic parody, Spectacular, is better-suited for that role. Warmonger is one of those many scientists, but his areas of expertise boil down into a niche much more conveniently. 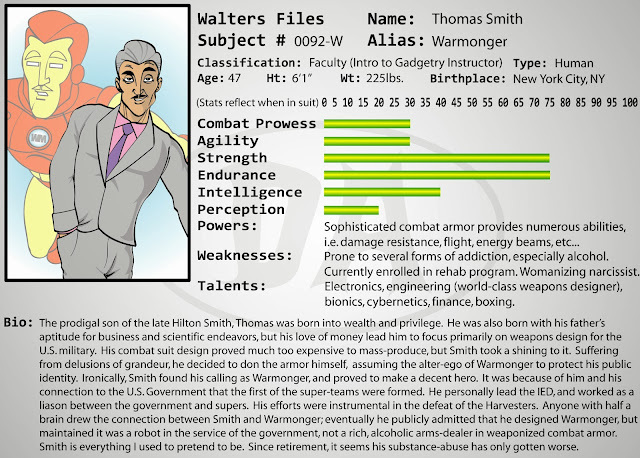 Mr. Walters, of course, would have made an ideal Gadgetry teacher as well, but he was equally suited to be the kick-assery teacher. I love the fact his face plate is just a template of his actual face. Yet people couldn't quite figure out who the man inside the suit was, haha. Yeah, it amuses me as well.